9870 SE 175 Street, Summerfield, FL.| MLS# 553006 | Spruce Creek Realty...Retirement Communities in Florida, Resale Homes In Spruce Creek South, The Villages, Stonecrest, Del Webb. 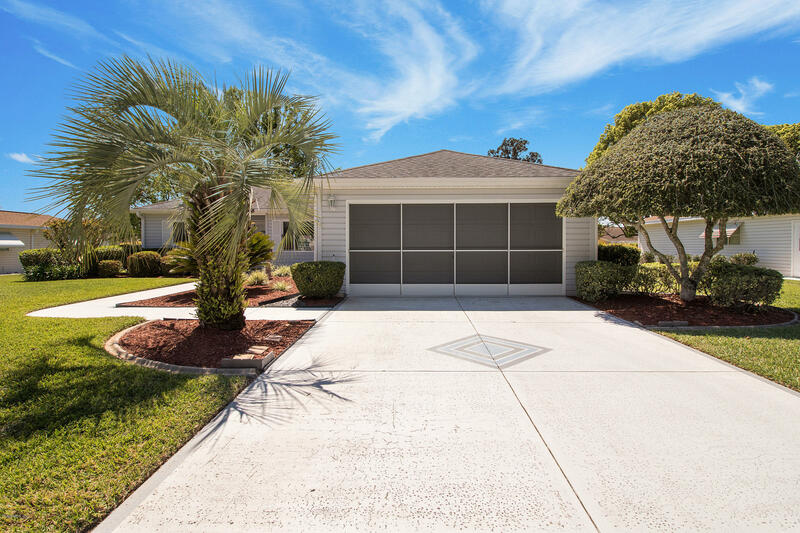 Beautiful & immaculately maintained Custom 2 BR/2 BA home w/great curb appeal. 1136 sf of living area, PLUS a 200 sf Sun Room under house roof. Tiled entry, cathedral ceilings, textured ceilings/walls (no popcorn), split bedroom plan w/23x13 Living Room. Light & bright kitchen w/picture window overlooking a nicely landscaped front yard. 20x10 Sun Room enclosed w/acrylic windows. Landscaping provides a very private back yard. Kitchen w/tile floor open to dining area has lots of cabinets,new range, overhead microwave & dishwasher. Double-door refrigerator w/ice maker & water in door, new sink/faucet, overhead lighting above cabinets. Garage has lots of nice cabinets over washer/dryer & counter top w/cabinets underneath-PLUS 5 free standing cabinets. Home is in pristine condition & in ready.